With Brexit seemingly intractable, some minds have inevitably sought solace in alternative pursuits. Golf? Hang-gliding? Cluedo? No, the real fun is apparently to be found in trying to find a replacement for the council tax. Cross-party talks are scheduled, at least in soft pencil, and Cosla are pitching in ideas, given that they have a decided stake in the outcome. Why does my soul not soar at this prospect? Why does my heart not beat a little faster? Because, of course, we have heard this many, many times previously. I recall when the Tories in the early 1990s, post-Thatcher, were similarly searching for a new way to fund local government. The poll tax - even Tory ministers had given up calling it the community charge - had proved less than popular. They needed new thinking. One Tory minister told me they looked at one point for a global perspective. They brought in an expert from, I think, Germany. When it came to local finance, this guy was the top banana. He had written the book - and revised it repeatedly. He studied. He scrutinised. He consulted. And the verdict? "You used to have a system called the rates. That seems to me to be ideal. Why not return to that? " As the pallor drained from sundry government faces, he persisted: "No, it is perfect. Easy to collect. Difficult to avoid. You should bring back the rates." He was quietly thanked and despatched. Politically, returning to the rates was a non-starter. The Scottish Conservatives had lobbied, with varying degrees of enthusiasm, for the poll tax in order to avoid the looming horror of a rates revaluation. Now, we are not back to those days. I do not envisage virulent partisan argument or street protest. Not least because the lessons have been learned from those earlier efforts. But the challenge of finding an acceptable system of local government funding is still pertinent. And problematic. Folk, mostly, dislike paying tax (whatever they say to pollsters.) Especially if they are uncertain what it provides. Especially, amplified, if they suspect that it is not being levied in a uniformly fair fashion. Then there are other elements. 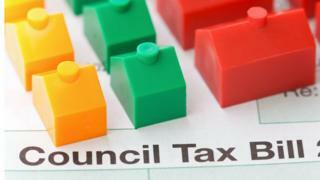 The council tax only covers around 13% of local authority expenditure. The rest comes from central government grants, business (or non-domestic) rates, rental income and the rest. Arguably, that reduces the democratic link between local council tax payers and their local authority. Plus gearing means that it takes a substantial increase in local taxation to make a big difference in overall income. For years, the Scottish government under the SNP froze the council tax, aware of its potential to annoy folk. Now, there is a cap on council levies - 3% in real terms, 4.8% in cash. Not all councils levy the maximum. There is a positive chorus of critics on hand. The council tax is unfair. It is monstrous. It must go. It should be replaced. Boo and again boo. Snag is that there is no consensus, yet, as to what might replace it. And, given the history, no single party is particularly keen to take the risk of a new system without buy-in from rivals. Before coming to office, the SNP talked eagerly of local income tax. In office, John Swinney took a serious look at the figures. He concluded that local income tax was a stinker, levying too much from one sector of society - wage-earners. But the search continues. When Mr Swinney's successor, Derek Mackay, struck a budget deal with the Greens earlier this year, he agreed to a medium to longish term look at council finance. He also agreed to look closely at a tourist tax and a workplace parking levy. The first remains contentious, the second is steadily gathering critics. In office, Mr Mackay and his colleagues have introduced reforms, shifting the load on to those in upper band properties in an effort to make the council tax more progressive. But the minister - who knows his history - is decidedly reluctant to bring in wholescale reform, however enthusiastically the Greens prod him. As I noted earlier, there have now been umpteen efforts to replace the council tax system by a range of political parties in power and in opposition. The most recent effort, just prior to the 2016 Holyrood elections, looked closely and resolutely at all the options and concluded: "There is no one ideal tax but we have shown that there are ways of designing a better tax system." That, friends, is where we still are. Hang-gliding, anyone?